Zero-point calibration via an external voltage signal lowers maintenance requirements. An adjustable limit switch allows users to connect equipment such as fans or signalling devices, and eliminates additional switching processes (optional). 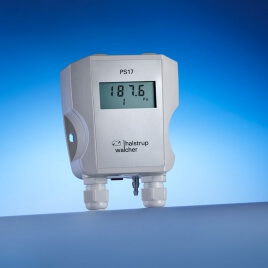 This pressure transmitter is particularly well suited for monitoring filters and pressures in HVAC (heating, ventilation and air conditioning) applications. DIP switches allow users to configure the output signal and switchable measurement ranges (optional). Settings provide an option for conversion to a root-extracted output signal (displayed as a % of the maximum output value). An internal button is also available for performing a zero-point correction or fine-tuning the end value. An optional display allows users to read the measured value directly on site in Pa or kPa. With an optional time constant (up to 10s), the instrument can produce an attenuated output signal, even under unstable pressure conditions. An optional two-wire version of the device is also available for reducing wiring complexity. In addition to simple wall-mounting with just 2 screws, the PS 17 is also suitable for mounting on top-hat rails. The device is also available with an optional ISO-compliant factory calibration certificate or a DAkkS calibration certificate.